At long last, the wait is over and the brined pork belly has made its way out of refrigerator as step 2 of the bacon experiment begins. Crucial to this step, and almost missed by yours truly, is to rinse the pork to remove the brine. No need to go hog-wild here, but the recipe does suggest a thorough scrubbing under cold water. Next, it’s on to a paper towel and patted dry. If you’re one of those who loves smoked food but do not have a smoker at home, then I will remind you that father’s day is just around the corner. Throughout all of recorded history there has not been one case of a man receiving a smoker as a gift and saying anything other than, “This is the happiest day of my life.” If you already have a smoker, I salute you and extend to you the secret smoker’s handshake. After placing the belly in the smoker, it’s time for more waiting. The recipe we followed called for 2 hours of cooking time to reach an internal temperature of 150 degrees. During this time one can engage in other household chores, outdoor gardening, pet grooming or simply linger in an aromatherapy induced meditative state as the hickory chips (choose your favorite wood) work their alchemical magic. 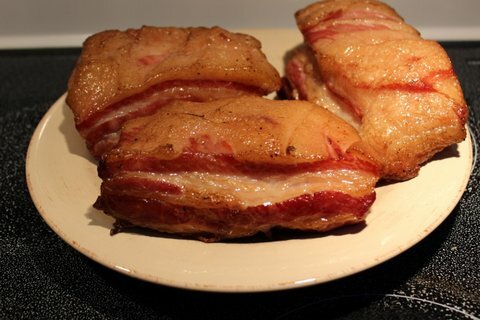 Once the internal temperature is reached, remove the bacon slabs, marveling at the rich color, and let sit to cool down. Before slicing, it’s recommended that you place the bacon into plastic bags, remove as much air as possible, and let them sit overnight in the refrigerator to firm up. Go ahead and start the countdown clock to breakfast. Stay tuned for Part III: Bacon, It’s Not Just for Breakfast.